In the rainy days, have you ever noticed that your pet is all wet after running outside? They may also feel cold and uncomfortable, especially in the winter. It's time to give them a raincoat to protect their bodies from rainwater and give them a good time to enjoy the rain. Colors: Blue, Red, Yellow, Brown. 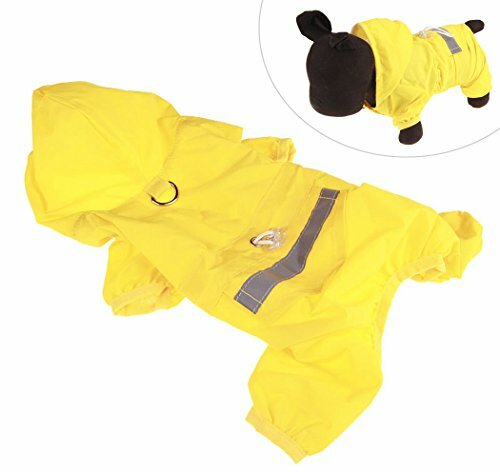 1 x waterproof jumpsuit raincoat. High quality waterproof fabric material: Use dense fiber material which is airtight,breathable and comfortable. Waterproof :This waterproof rain jacket help to keep pets dry and comfortable in wet weather. It can satisfy pets' needs to walk in the outside when it is rain. Lightweight &durable: This coat easily tucks into a convenient carrying pouch so you can carry it on your leash or stow it in your car. Wonderful reflective strip design: Professional reflective strip design is simple and practical. Reflective strip on back not only provides extra visibility in the rain. But also ensures the security of dog out at night. Size: There are varieties of size you could choose. Whatever your dog is big or small, there is a size ready for your dog. If you have any questions about this product by Xiaoyu, contact us by completing and submitting the form below. If you are looking for a specif part number, please include it with your message.